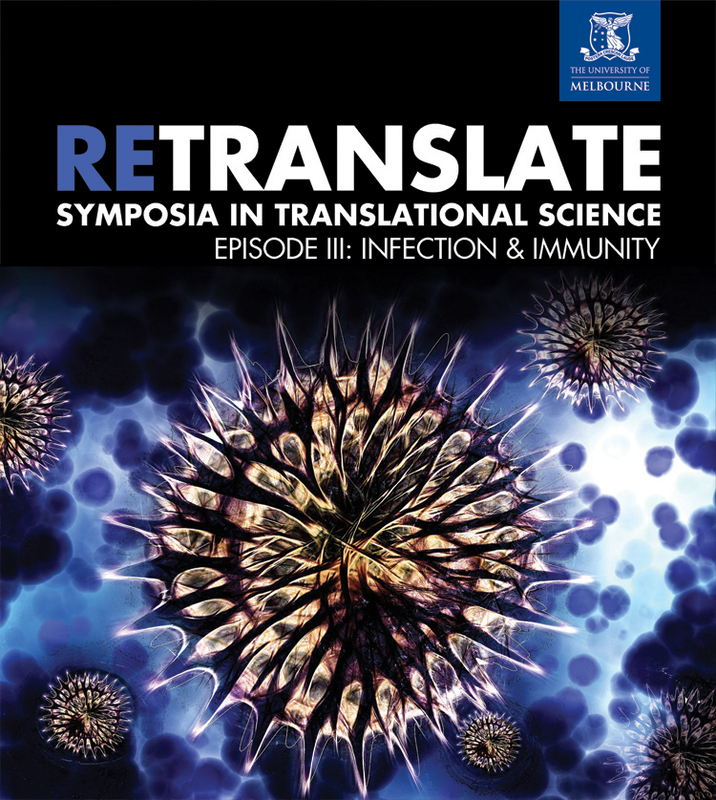 RETRANSLATE: Symposia in Translational Science are annual events for past and present students of the Melbourne Medical School, presented by the Melbourne Medical School Student Ambassadors. A different topic in medicine is explored each year, some of which include neuroscience, paediatrics, infection & immunity. Episode III: Infection & Immunity will explore antimicrobial resistance with some of our best researchers and clinicians, focusing on challenges and solutions . Professor Sharon Lewin is an infectious diseases physician and scientist who is internationally renowned for her research into all aspects of HIV disease and pathogenesis. She is the inaugural director of the Doherty Institute for Infection and Immunity at the University of Melbourne; consultant physician at the Alfred Hospital; and an Australian National Health and Medical Research Council (NHMRC) Practitioner Fellow. She was previously Head, Department of Infectious Diseases, The Alfred Hospital and Monash University (2003 – 2014) and Co-head, Centre for Biomedical Research, Burnet Institute (2010-2014). Her laboratory focuses on strategies to cure HIV infection, immune reconstitution following antiviral therapy, and pathogenesis of HIV-Hepatitis B co-infection. Professor Lewin was the local co-chair of the 20th International AIDS Conference (AIDS 2014), which was the largest health conference ever held in Australia. She is on the leadership team of the International AIDS Society’s Strategy Towards an HIV Cure and a member of the Australian Government Ministerial Advisory Committee on Blood Borne Viruses and Sexually Transmitted Infections. Prof. Christine Kilpatrick, MBBS, MBA, M.D., FRACP, FRACMA, FAICD, commenced as Chief Executive, Melbourne Health in May 2017. Previous appointments include Chief Executive, The Royal Children’s Hospital from 2008 – 2017, Executive Director Medical Services, and Executive Director Royal Melbourne Hospital, Melbourne Health. She trained as a neurologist, specialising in epilepsy. She was appointed a Fellow of the Australian Academy of Health and Medical Science in 2015. Prof. Kilpatrick has held several external appointments including Chair Victorian Quality Council in Healthcare and Member of the Women’s and Children’s Health Board. She was awarded a Centenary medal in 2003, and in 2014 was included in the Victorian Honour Roll of Women. Professor Benjamin Howden is Director of the Microbiological Diagnostic Unit Public Health Laboratory, and Medical Director of Doherty Applied Microbial Genomics in the Department of Microbiology and Immunology at the University of Melbourne, within the Doherty Institute for Infection and Immunity. He is also an Infectious Diseases Physician at Austin Health in Melbourne. As Director of MDU PHL Professor Howden oversees state and national public health microbiology service activities. His research interests have been driven by working in the hospital system, and more recently in public health, where antibiotic resistant pathogens such as methicillin-resistant S. aureus, vancomycin-resistant Enterococci, and carbapenem-resistant Enterobacteriaceae are major problems. His current research activities include the application of genomics to understand the emergence, spread and pathogenesis of antimicrobial resistance bacterial pathogens; understanding the mechanisms and impacts of antimicrobial resistance, microbial adaptation, and changes in host-pathogen interactions during persistent Staphylococcus aureus infection; and exploring the role of genomics in public health and clinical microbiology. Professor Jodie McVernon is a Medical Graduate with subspecialty training in Paediatrics, Public Health and Vaccinology. She has extensive expertise in clinical vaccine trials, epidemiologic studies and mathematical modelling of infectious diseases, gained at the University of Oxford, Health Protection Agency London and University of Melbourne. She is Director of Epidemiology at the Peter Doherty Institute for Infection and Immunity, a joint venture of the University of Melbourne and Royal Melbourne Hospital. She is a National Health and Medical Research Council (NHMRC) Principal Research Fellow, and leads an NHMRC-funded nationally distributed Centre of Research Excellence in Policy Relevant Infectious Diseases Simulation and Mathematical Modelling (www.prism.edu.au). Her research group uses mathematical and computational models to advance understanding of infectious disease epidemiology, and consider the likely impacts of interventions to limit infection spread and burden. Professor Karin Thursky is the Deputy Head of Infectious Diseases at the Peter MacCallum Cancer Centre; Director (CIA) of the NHMRC CRE National Centre for Antimicrobial Stewardship, which takes a One Health approach to antimicrobial stewardship across all human and animal sectors; Director of the Guidance Group at the Royal Melbourne Hospital and Peter Doherty Institute for Infection and Immunity; and principal fellow in the Department of Medicine at the University of Melbourne and the Sir Peter MacCallum Department of Oncology. An infectious diseases physician, she is a leader in the design and implementation of antimicrobial stewardship programs, with particular expertise in the use of computerised systems to support better antibiotic prescribing. The Guidance program, which supports clinical teams in hospitals to monitor the appropriateness and safety of antibiotic use, is being implemented in over 60 hospitals across Australia. The National Antimicrobial Prescribing Survey, delivered by her team, is a core component of the National Antimicrobial Resistance Strategy. Her multidisciplinary team of clinician and health service researchers is working to establish and implement antimicrobial stewardship programs across animal and human health sectors. Professor Cheryl Jones is President of the Australasian Society for Infectious Diseases (ASID). She is the Stevenson Chair of Paediatrics and Department Head, at the University of Melbourne, an infectious diseases physician at Royal Children’s Hospital, Melbourne, and an internationally recognised research leader in childhood infectious diseases. She co-leads the Clinical Infectious Diseases group at Murdoch Children’s Research Institute, the CNSI3 Node at the Marie Bashir Institute for infectious Diseases and Biosecurity (Sydney) and the Australian Childhood Encephalitis (ACE) study. Professor Jones has earned over $25M in peer reviewed funding, including three NHRMC Centres for Research excellence; most recently NHMRC CRE in protecting the public against emerging infectious diseases (CREID). She has led ASID advocacy for action against antimicrobial resistance, and sits on the Technical advisory group for this purpose (ASTAG). with some of our best researchers and clinicians. The Medical Student Relief Bursary is a bursary for medical students, led by medical students. Its purpose is to provide support to fellow students during times of unexpected financial distress. Small bursaries are granted to students experiencing unforeseen circumstances to provide financial support that assists them to continue their studies.